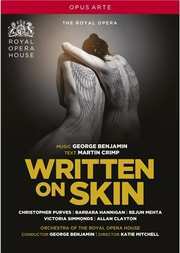 With a score by George Benjamin and text by Martin Crimp, Written on Skin has been hailed as 'magic and irresistable...the best opera written over the last twenty years' (Le Monde). A cruel and powerful Protector asks a mysterious Boy to create an illuminated book in honour of his wealth and family. He invites the Boy into his home, little realising that this will lead to a journey of startling, joyful and ultimately tragic self-discovery for the Protector's oppressed and much younger wife Agnès. Acclaimed director Katie Mitchell brings this dark and intense story to life in an inventive production that skilfully combines elements of the past and present, with Benjamin himself conducting.